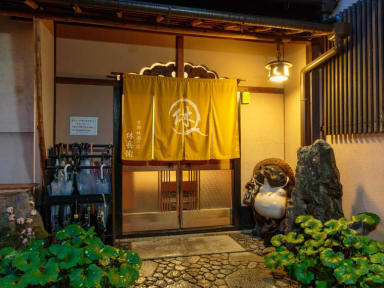 Ryokan Q-beh is located in the historical district of 'Gion' area where 'maiko' walk around, and just a couple of minutes walk to some popular temples and shrines. 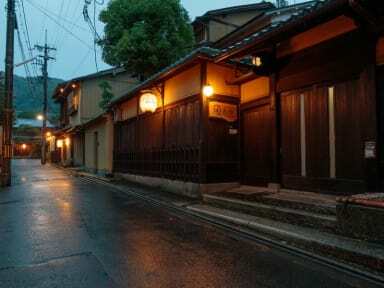 So the surrounding area is very quiet, beautiful and calm. There are three communal places to eat, drink and chat. A Japanese style tatami floor living room with fully-equipped kitchen. A dining area with table and chairs for those who are not yet attached to the Japanese style. Also an observation room where you can look over a Japanese garden on the third floor. +Free coffee, tea and green tea. +Free Wi-Fi internet access available anywhere. +Free common PCs available in living room. +Smoke-free (There is a smoking area outside). +Coin operated washing machines (200yen/per load) and dryers (100yen/15 minutes) are available. This room consists of ten tatami mats. The room is air-conditioned. Bath towels and yukata (Japanese garment) are prepared.The room is with garden view. yukata (Japanese garment) are prepared. This room consists of twelve tatami mats. The room is air-conditioned. Bath towels and yukata (Japanese garment) are prepared.The room is with garden view. I was there for one night only but so far it was a good experience. Nice location.clean.comfy beds.luggage storage.helpful staff. What else do you need? !